Niche productions & Sydney Tropical heavyweights Pineapple Republic are extremely hyped to present QUANTIC for a one off Sydney show in the intimate surrounds of the Goodgod Danceteria. 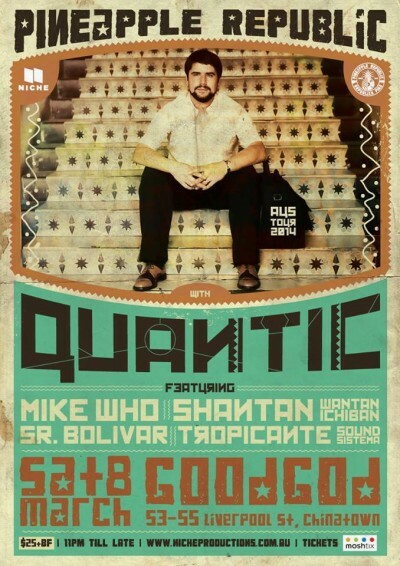 Quantic is a world renowned British born Musician, Producer & DJ that makes Soul, Electronic & Latin music deeply rooted in the tropical sound waves of the Caribbean. Quantic is now living and working from his Sonido del Valle studio base in the highlands of Bogota, Colombia where he is currently at work on his fourth Quantic record – his fifteenth studio album to date. The album is to feature influences from Ethiopian Jazz to Haitian Compas, Salsa Dura from his Colombian homestead to Detroit techno. The party will run through to the early hours of the morning with resident Pineapple Republic selectors Mike Who, Sr. Bolivar, Shantan Wantan Ichiban and Tropicante Sound Sistema joining the dots between Quantic’s Huge back catalogue of originals, remixes, edits and secret weapons. Expect an amazing night of Hand selected tunes from all the corners of the globe aimed squarely at the dance floor!! ♫ LISTEN: To the first single ‘Duvidó feat. Pongolove’ from Quantic’s new album Magnetica coming out in May this year.